Nice hotel reservations. Guide to all Nice hotels. 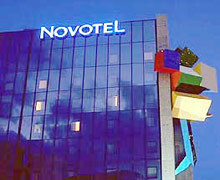 Find Nice hotels and book on-line. * Do not type the word "hotel", use only the name of the hotel. Example: "Ritz"
The Ibis Nice Promenade Des Anglais hotel is the standart class hotel, located 1 km from Nice airport, 3 km from city center in the western part of the it, and 1 km from the beach area.